The sixth BMC Ecology Image Competition received more than 145 photographs from talented ecologists around the world, showcasing the amazing biodiversity, natural beauty and biological interactions found in nature. Anyone affiliated with a research institute was able to enter and we were amazed by both the quality and variety of submissions. Our guest judge, Zhigang Jiang of Institute of Zoology, Chinese Academy of Sciences, China selected the overall winner and runner ups while our BMC Ecology Section Editors chose the winning entry from their sections of the journal. Our accompanying editorial gives more information about the winning images and the reasoning beyond why they were picked. This also includes a selection of 6 highly commended images; there are some really great photos so please do take a look! Our overall winning image of the clearwing butterfly (Hypomenitis enigma), was taken by Marianne Elias of Sorbonne University, France. This photo was taken in the southern Andes of Ecuador (2000m asl, Zamora-Chinchipe province) two hours after the butterfly had emerged from its chrysalis. Our winning image in this category was taken by Arnaud Badiane from France. Arnaud has given the photo the title ‘Home in mother’s arms’, and shows a young Barbary macaque (Macaca silvanus) tucked in close to its mother. Chosen by Section Editors Luke Jacobus and Josef Settele, our winner in this category was another entry by Pilar Oliva Vidal, titled ‘Little treasures of the steppes’. Our winner in this category is entitled ‘Meadow Brown & solitary bee’. The photo was taken by William Mills of University of Brighton, UK. This category’s winning image was taken on the island of Hawaii by Sabrina Koehler of Kiel University, Germany. 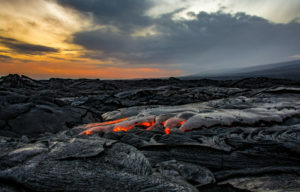 It shows a section of active lava flow from the Kilauea Volcano. My choice as the Editor is entitled ‘Small Bridges’ and was captured by Darko Davor Cotoras Viedma of California Academy of Sciences, United States. Congratulations to all of our winners! Their images, along with our highly commended entries, have been released under a Creative Commons Attribution License (CC BY), so everyone is welcome and encouraged to share them freely, as long as you clearly attribute the image author.